“ARMS: – Argent on a bridge (silver bridge) of five arches proper resting on a point azure (blue coloured point of sword) therein three fishes naiant (swimming) 2 and 1 of the first a stag in full course of second attired or pursued by a springing greyhound sable langued gules (black greyhound with the CREST: a raven proper, with the MOTTO: – “Fedelis in aeterum” (eternal faithfulness) and for SUPPORTERS:- two greyhounds proper collared gules edged gold (red collars edged in gold)”. Black – Raven, supporter’s collars, underside and collar armour and motto. Just reading the above, while it is almost correct the dogs are in fact Irish Wolfhounds, sometimes known as Irish Greyhounds, irish Wolfdogs. They appear to be smooth haired but depends on what image you look at. 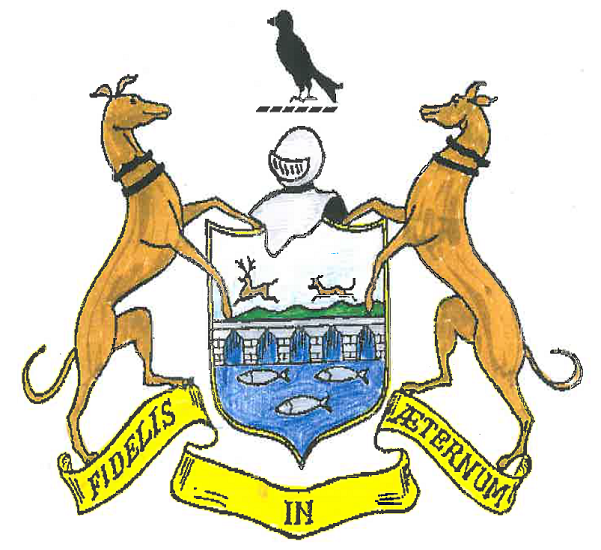 The Wolfhound chasing the stag also appears on the New Ross coat of Arms. Think the Sword dates from 1656 and the Mace 1663 as recorded in The Irish Wolfdog by Edmund Hogan SJ in 1897. The Irish Wolfhound Club hold much information in our archives as the Wolfhound was also used as a symbol of Ireland. They appear around the country on many monuments and buildings since the birth of Irish Nationalism but also on much older items. Sometimes depicted with smooth hair or shaggy coats and often with some feature not quiet correct. My grandfather was mayor of the town for 5 years in the 1930’s and grandmother pointed this out to me also. Can you please correct this to the 3 Wolfhounds. My grandmother’s father Mr Arthur of Parnell St took many photos of the town for Postcards published around 1910, think there were at least 26 images. Sadly she loaned the best ones she had to a Mr Fenton of the local Nationalist for publication each week in the early 1970’s and some were but he never gave them back. Still have most of the set even 2 of some cars at the Rink Garage about 1910 one the postcard that was produced then and a second taken of the same group but standing in slightly different positions with about 5 cars/hackneys.